"These won't be new words heard today about Joe...kind, insatiably interested in subjects he wanted to know about, look-you-in-the-eye caring, loyal, trusting, lived a life marked by the spirit of adventure, inspired questioning, sweet...and there I want to pause and share that three days before Joe died, I received a box of 'Shirley' tulips from him. We had only days before shared in the Harris Teeter parking lot, (accompanied by Bev Kowalec), a plan for him to visit our farm and see our gardens in the spring. Joe had sent me three such boxes in the past. He is, and will be, a very real part of me. In each tulip face I will see his sweet, jovial, light-up-the-world smile and will be encouraged to reflect it in the world. Thank you Joe." "I don't have anything profound to say. Joe was just such a constant presence in local Democratic politics and a dependable and wise counselor for me that my political world seems out of balance without him. For me, he provided some kind of solid link with what is right about the Chapel Hill/Carrboro community. I didn't ever see a chink in his armor, and I disagreed with those who did. I just wanted to be with other people who had the same kind of experience with him. I'll be thinking about you all and Joe on Thursday." Different people in different places have written of Joe's myriad of social works. Obviously these need to be remembered; they were his greatest passion. But they weren't his only one. I loved Joe's passion for life - his love of people of all stripes, of movies (what great reviews! ), of opera, Mozart, Vermeer, fine food (of course not furry creatures - he loved them as well), good tea, of travel all over the world and much more. It's nice to recount some of these more personal things to each other. Also, because of his nature, we are all having to help fill in the blanks. I think I can help on a couple things. As for his Judaism, I believe Joe was bar mitzvahed at 13. This is classic Joe - I don't think his father practiced his religion, but Joe, after having read about many different faiths, decided he wanted to be a practicing Jew. As a teenager, Joe was often called to the synagogue to help make a minion (10 adult Jews needed for God to hear their prayers). I do think his faith became more important to him over the last few years. Joe didn't quite get to all the Vermeers - I believe there were a couple in Germany and another somewhere else in Europe that he missed. (Though if he did see all the ones on public display he planned on knocking on the door of the woman who owns the one not publicly shown - I think a widow of a Johnson & Johnson heir in NJ - I always liked the mental image I have of this possible encounter). He decided he wanted to concentrate his last travels elsewhere. He did make it to all fifty states. The last couple were within the last few years. One of my favorite Joe postcards was from his last state (Missouri?) - it said only "How about the territories?". Concerning his papers, Joe did mention to me a number of times over the last few years that he wondered if Wilson Library would be interested. He wrote in his journal daily from the day Stalin died (1956?) until he fell ill a couple years ago. I, for one, would certainly be interested in reading what he wrote. I sure do miss him. CHAPEL HILL, N.C. — Civil rights activist and former Franklin resident Joseph Herzenberg will be honored with simultaneous memorial services in Chapel Hill and at F. John Ramsey Funeral Home in Franklin on Thursday at 10:30 a.m.
A former history professor at Tougaloo College in Jackson, Miss., Herzenberg died Sunday, Oct. 28, 2007, due to complications from diabetes. He was 66. After relocating to Chapel Hill in the 1970s, he became the first openly gay elected official in the state when he won a seat on the Chapel Hill Town Council in 1987. 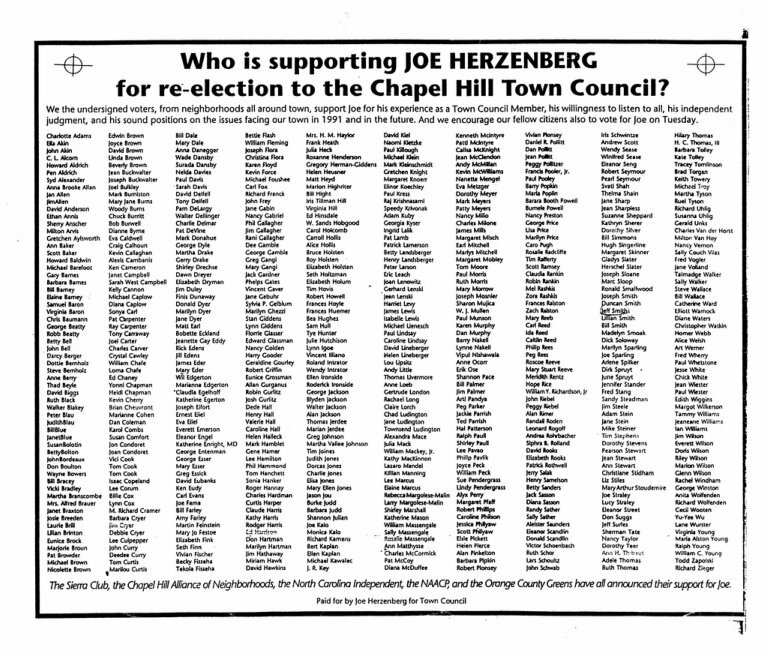 "A lot of people think of Chapel Hill as being this liberal bastion, but it was a fight," explained Herzenberg's friend and current Town Council member Mark Kleinschmidt, noting that Herzenberg had been temporarily appointed to the council in 1979, but lost his bids for reelection in 1981 and 1983. After barely winning the last open seat in 1987, Herzenberg went on to become a popular public figure throughout Chapel Hill. "It's not that he just knew all the businessmen on (Chapel Hill center) Franklin Street, he knew all the homeless guys by name," said Mark Chilton, mayor of Carrboro, N.C., and former Chapel Hill Town Council member. "He saw all those different people as individuals to be represented. He had a great sense of humor, and I think for a lot of folks from Chapel Hill, he's a figure that people very much associate with the town." Throughout his years on the council, Herzenberg fought to fund the town library system, register the downtown area as a historic district, and preserve town parks with a greenway system of bicycle paths and walking trails connecting them all. "He really set the bar for environmental protection and preserving open space, as well as using his seat on the council as a place to speak about equality and justice issues," said Kleinschmidt, adding that these issues made Herzenberg the No. 1 vote-getter upon his re-election in 1991. "He was extremely popular, becoming himself part of the heart of Chapel Hill. He really left this (town) a better place." Though he had traveled all over the world, Chilton said, "Joe was very proud of being from New Jersey, particularly from that northwestern area. 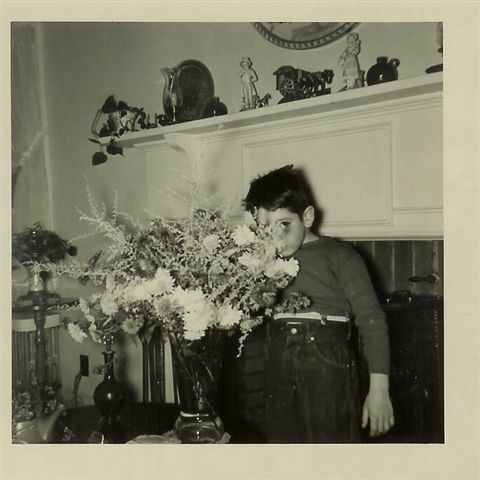 He would always scold people who had anything negative to say about New Jersey, and point out that most folks who said such things had never been to the parts of New Jersey that were really beautiful." Herzenberg is survived by his brother, Robert Herzenberg; sister-in-law, Deborrah Herzenberg DiMatteo; nephew, Michael; and niece, Sarah. He was predeceased by a brother, David C. Herzenberg, who was a prominent Sussex County attorney who once headed up the Somerset-Sussex Legal Services and did much pro bono work on behalf of the needy. 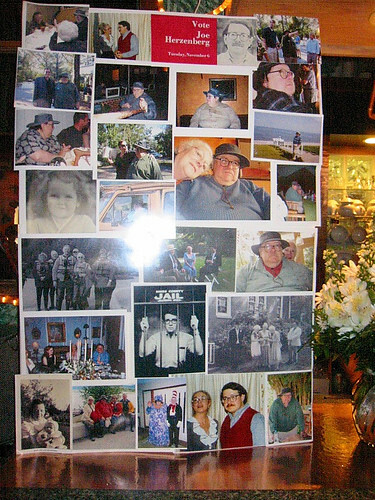 We lost one of the very best of us when Joe Herzenberg passed away last week. Joe and Chapel Hill were so much a part of each other that it's difficult to imagine the town without him. Not least because, if not for him, Chapel Hill wouldn't be the Chapel Hill we know. He changed this place, not only through his remarkable political career, but through his vast store of knowledge, his garrulous personality, and his ubiquitous presence. He fully deserved his unofficial title, mayor of Franklin Street, and his unwavering commitment to the fundamental but all too frequently forgotten proposition that all people are created equal and deserve to be treated that way, with justice and compassion. His groundbreaking political career is well known around here. He participated in the Freedom Summer voter registration efforts in Mississippi in 1963 and came here in the early 1970s to go to graduate school. He immediately immersed himself in local and state politics, culture and history, and when he was elected to the Chapel Hill Town Council in 1987 he became the first openly gay elected official in the state, and probably in the South. He opened the door for others to follow. He was a champion not only of gay rights, but of civil rights in general, social justice, environmental protection and other issues. In a town with a long history of activism, he's right up there at the top. He managed somehow to be at once a giant of a man and just Joe. And when many of us think of him, we don't think of him speechifying or voting at the council table. We think of him where we so often saw him, on the Franklin Street he loved and knew so well, wearing his trademark floppy hat, talking to everyone. Matt Stiegler, Joe, and Fred Young at Joe's Stonewall party, 2004. 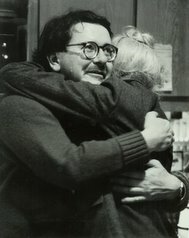 Joe Herzenberg — the first openly gay elected official in the American South, an ardent defender of civil rights and the environment, and the unofficial Mayor of Franklin Street — died on October 28, 2007 at UNC Hospital. He was 66 years old. Joe was born June 25, 1941, to Morris & Marjorie Herzenberg. His father owned the town pharmacy in Franklin, N.J., where Joe grew up. After he graduated from Yale University in 1964, Joe went to Mississippi to participate in voter registration for Freedom Summer. He joined the faculty of historically-black Tougaloo College, where he was appointed chair of the history department. A very popular instructor, Joe was named an honorary member of Delta Sigma Theta sorority. During this time, Joe was briefly married. Joe arrived in Chapel Hill in the early 1970s to enroll as a graduate student in history at the University of North Carolina, and, along with his partner Lightning Brown, immediately immersed himself in local, state, and national politics. Although Joe’s first campaign for Chapel Hill town council in 1979 was unsuccessful, he was appointed to the council that year to fill a vacant seat and served until 1981. In 1987, he was elected to the council, becoming the South’s first openly gay elected official. He was re-elected in 1991 with the highest vote tally in the four seat race (and, up to that time, the highest vote total ever in a Town Council race), and served until 1993. 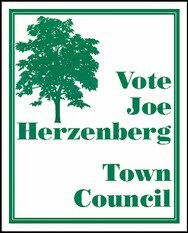 As a council member, Joe was responsible for creation of the Chapel Hill greenway system and enactment of the town’s tree protection ordinance. Joe remained active in civic and political activities. He was a founding board member of Pride PAC, a statewide lesbian and gay political action committee now known as Equality NC. He also served on the board of the American Civil Liberties Union of North Carolina and the Fund for Southern Communities. He served as chair of the local greenways commission, the tree commission, and the libraries bond task force, and served on several other local boards. Joe also organized Chapel Hill’s annual Bill of Rights Day celebration. Throughout his time in Chapel Hill, Joe was an ardent Democratic Party supporter, serving as longtime chair of his precinct. His party activism brought him brief notoriety in 1984, when Senator Jesse Helms angrily raged at his opponent Jim Hunt during a live televised debate “You’re supported by people like Joe Herzenberg and Lightning Brown!” – a moment that Joe was forever after proud of. Joe received a Citizen’s Award from the Independent newsweekly in 1984, the first year that award was given. 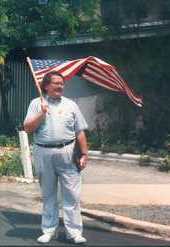 Joe was an enthusiastic traveler who visited all seven continents and all 50 states. He also loved art and music. He was a member of Chapel Hill Kehillah. Joe is survived by his brother Bobby, his sister-in-law Debbie, his nephew Michael, and his niece Sarah. He was pre-deceased by his brother David. In lieu of flowers, well-wishers are asked to make contributions in his name to Equality NC, http://www.equalitync.org, or the Inter-faith Council for Social Services, http://www.ifcweb.org. Joe visiting the Netherlands, 1998.